First skill basically says ‘commit your proper board or don’t bother’. Sounds like something a player would just do anyway but I personally wouldn’t like my Raopia, sitting at the back, powered up through a retire, to not have the ability to swing at the VG because it can’t move up. 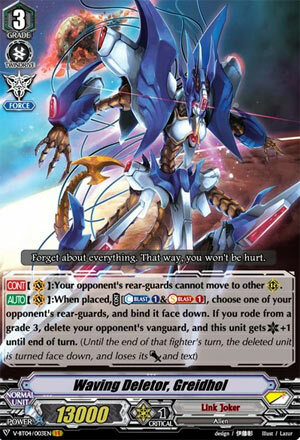 That’s where cards like Geali and other Vanish Delete cards thrive: the whole point is that this punishes commiting to a board, except if you don’t all your offense will be used to guard with Greion later, or even this should you ride and get the Delete off. Obviously without the capacity to Delete unless you ride this second this basically is part of the Imperial Daughter camp, but with something like Greion lurking it pretty much has to be that way because two kickass first rides would be just unacceptable.